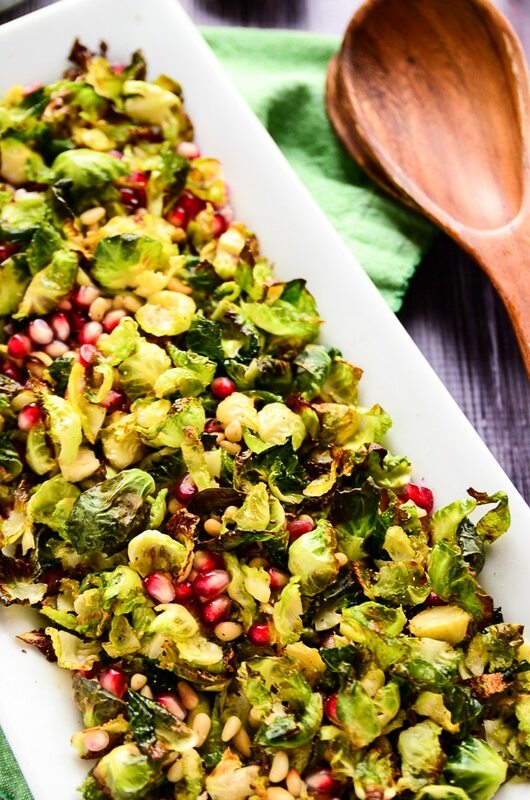 Although this vegan crispy brussels sprout salad with pomegranate seeds is dressed from head to toe in red and green, it’s completely Thanksgiving appropriate. 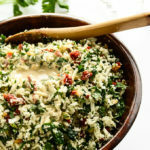 It can be served as a side or salad course, and it’s one of those dishes that you I can’t seem to scoop into my mouth quickly enough. Do you know what I’m talking about? That hurried fork-to-plate, fork-to-mouth movement that seems to be set on autopilot-repeat as if this might actually be the last salad of its kind in the whole, wide world? There’s no telling what will happen when you put this crispy, crunchy, sweet, and savory salad down on the table. 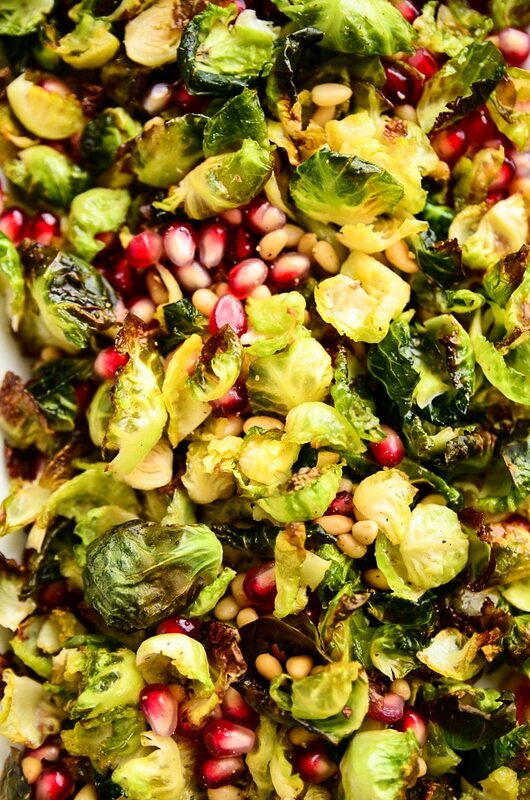 My warning to you: prepare your napkins and twist your shiny locks up into a bun; brussels sprouts and pomegranate seeds have a tendency to fly. And if you’re anything like me, blushing is likely to occur when you find a stray, still-crisp brussels sprout leaf in your hair nearly three hours after you’ve eaten this salad for lunch. Shh, don’t tell Dan. This salad is a slight labor of love but worth every second in the kitchen. The laborious part is trimming each and every brussels sprout and meticulously removing each leaf, one-by-one. Before you disregard this recipe as being wrought by a crazy person, hear me out. Separating the leaves and massaging them with olive oil before popping them in the oven allows nearly each and every one to crisp up in a chip-like fashion. This method of baking makes them so addictive that it’s risky to taste-test before assembling the salad because you’re likely to come up short a few dozen leaves. 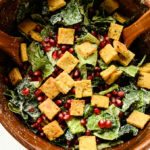 Once you have an abundance of crispy sprout leaves, you’ll add them to a serving bowl or platter, toss in a generous amount of pomegranate seeds, and sprinkle with pine nuts. 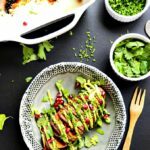 Then, you’ll pour a tangy lime-tahini vinaigrette over top, toss to coat, serve, and observe as happiness spreads across the faces at your dinner table. 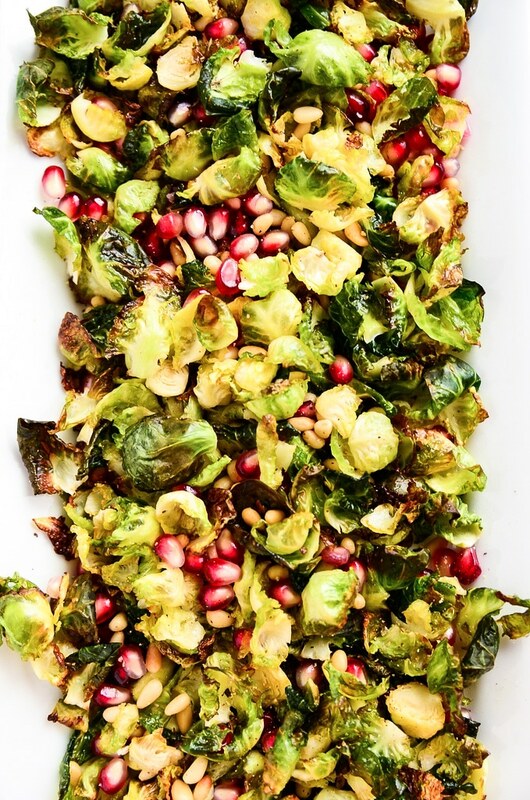 Crispy, oven-baked brussels sprout leaves are tossed in a tangy lime vinaigrette and topped with pomegranate seeds and pine nuts. 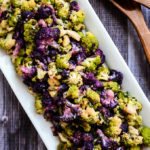 This salad makes an excellent side dish for a festive holiday gathering but is also delicious served as a light lunch or dinner during the chilly winter months! One at a time, trim the brussels sprouts and separate the leaves. You will need to trim the base of the sprout a few times to get as many leaves as possible from each. Add the leaves to the baking pans and repeat with each sprout. Once all of the leaves have been added to the pans, drizzle each pan with 1 tablespoon olive oil and massage the oil into the leaves. Spread the leaves out evenly over each pan and bake for 15-20 minutes or until most of the leaves are crispy and just turning golden. Make sure to toss the leaves every few minutes as they bake to prevent burning. Remove from oven and let cool slightly. While the leaves are baking, make the vinaigrette by adding the lime juice, apple cider vinegar, olive oil, tahini, maple syrup, salt, and pepper to a small bowl. Whisk for 15-30 seconds until incorporated. 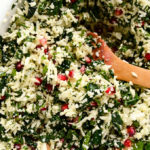 To serve the salad, add the leaves to a serving bowl or tray along with the pomegranate seeds and pine nuts. Pour the dressing over, toss to coat, and serve immediately. I will happily pull apart each and every sprout to get that crispyness that I LOVE when they are roasted! Also, the pom seeds are just taking this to the next level, love! I promise it will be worth all that tedious leaf-plucking, Abby! The pom seeds: OMG. I’m currently addicted. 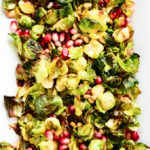 I just recently discovered how tasty roasted brussels sprouts are and I have to say I’m a little obsessed! I’m intrigued by the method of separating the leaves, I bet this makes it extra crispy! This salad looks like an amazing combination of flavors. I’ll have to add to my holiday dish wish list! Hi, Larice! Aren’t brussels sprouts so tasty? I’m not sure why they had a bad reputation for so long, because they’re so versatile and delicious. Separating the leaves helps them crisp up so much more, and it’s a fun way to eat them — almost like sprout confetti! Is there anything else that can be subbed for the tahini? I’m all out but this looks amazing! Hi Erin! I’m so sorry for my delay on replying! You can sub almond butter if you have that on hand; it might add a bit more flavor than tahini would, but it should meld nicely with the other ingredients. This was a huge hit at Christmas Dinner. I should have doubled the recipe! I have tried to like brussels sprouts because my husband loves them. I have cooked them all different ways with and without sauce. I have now enjoyed them twice. Once as a fried chip at a restaurant in NY and now in this tasty salad which I will make again and again. Erin! 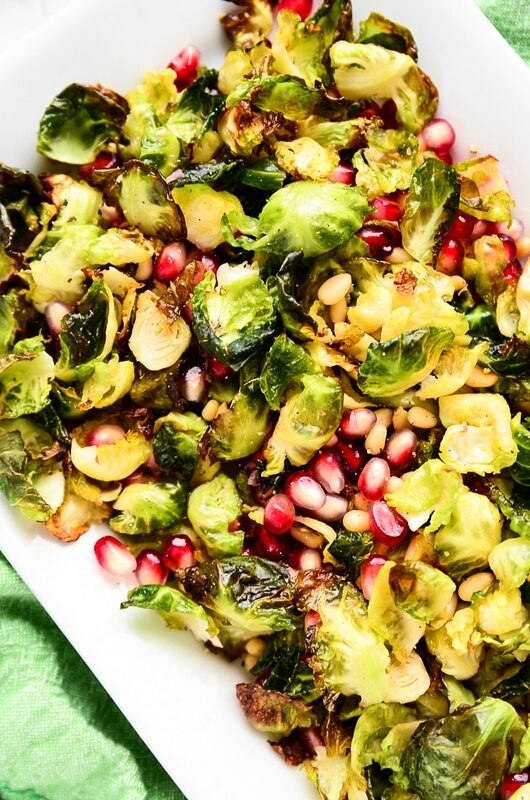 I love that you and your husband race to get the prep done on the sprouts — too cute! 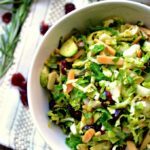 I should see if Dan will participate in a brussels sprout leaf-peeling race with me :) Also, so happy that you’re loving this salad, and I’m right there with you on eating it all by yourself. There’s something so addictive about crunchy little sprout leaves! Thanks for taking the time to comment with your feedback! My grocer didn’t have tahini so I substituted almond butter as you suggested and it was great. 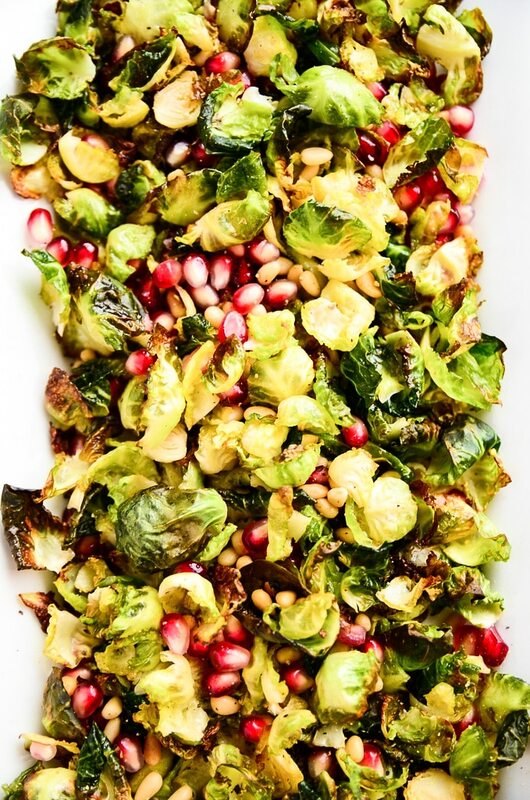 The first time I made the sprouts I burned half of them because I got distracted…major bummer. But, I had a bunch of arugula left over (from one of your other recipes!) that I added instead for extra bulk, and it worked really well in a pinch in case anyone else experiences that tragedy! So good with almond butter … I love this salad!!! Thanks, Erin! So glad that you’re enjoying it! !